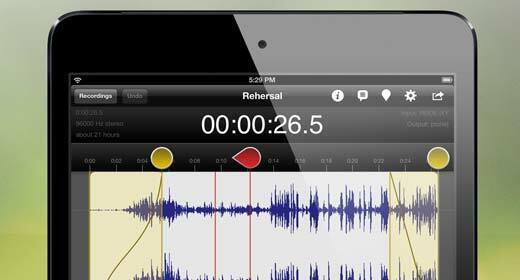 RØDE Microphones is excited to announce the next iteration of its field recording app for Apple’s iOS devices, RØDE Rec. This update, released to the app store today as a free upgrade, has a number of enhancements including a dedicated iPad interface, MP3 publishing and support for ten different languages. RØDE Rec has been incredibly well received since its launch in January of this year, where it was the only app on the market to allow for recording at 24-bit/96kHz (using RØDE’s i-XY stereo microphone). This is the first update since RØDE acquired the FiRe app from creator Audiofile Engineering, and signals RØDE’s intention to provide not only the best field recording app for mobile devices, but a platform that rivals dedicated audio field recorders. The update’s addition of a retina-compatible iPad interface enhances control on the larger device considerably. Users can now view the waveform, transport controls, non-linear editing and much more, all in the one screen making recording, editing and publishing a breeze. The popular MP3 format has also been added, following overwhelming demand from existing users. “While RØDE Rec is designed for the capture and sharing of broadcast-grade audio there’s no denying the popularity and indeed the convenience of the MP3 format.” explains Damien Wilson, RØDE’s Global Marketing & Sales Director. This updated version also marks the app’s debut in localised languages, with support for Spanish, French, German, Italian, Portuguese, Russian, Chinese (simplified), Japanese and Korean, in addition to English. The localised apps are available on the relevant international iTunes App stores. An update to RØDE Rec LE, the free, feature-limited version of RØDE Rec will be released shortly, including the dedicated iPad interface and enhanced stability. Download the app now for iPhone, iPad or iPod touch on the iTunes App Store or via www.rode.com/getroderec.